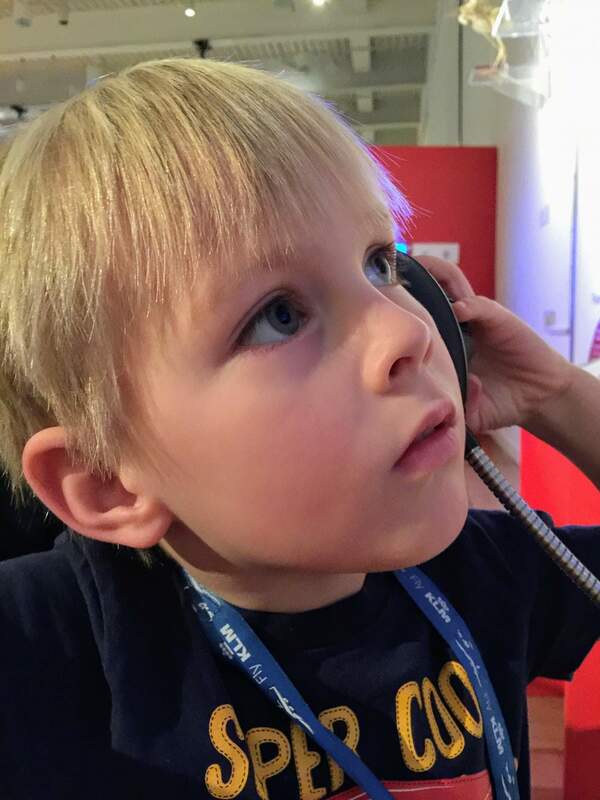 My 4 year old is super curious. In a very scientific way; he wants to know everything there is to know about the world. I was late for pick up at his preschool the other day and his teachers were talking to him about gravity, because he’d been asking while waiting for me. They laughed that they’d been trying to think how to explain it in a way he’d understand, and ended up just saying it as it is – “he just gets it”. We visited the DFDS Ferries talk by Michaela Strachan last week, and since then I’ve been inundated with questions about whales and dolphins. 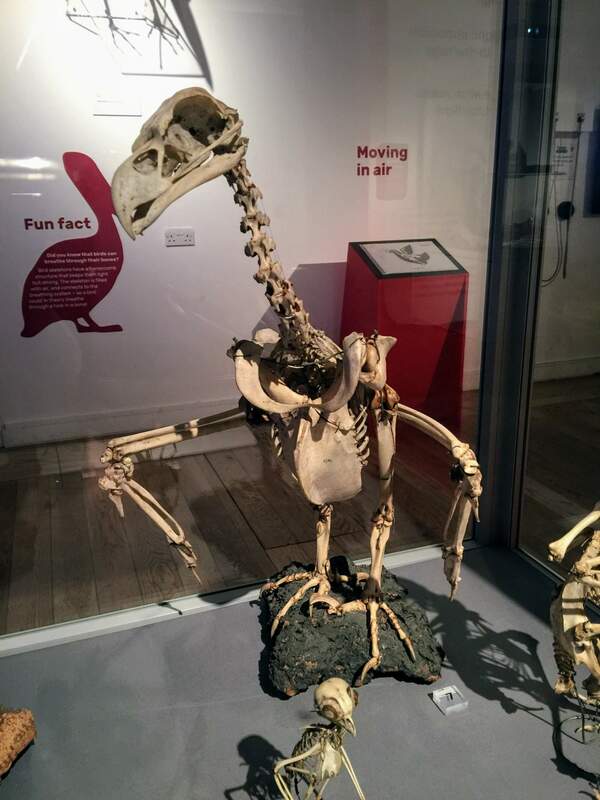 And so with his curiosity in mind, we headed into Newcastle-upon-Tyne to see the (relatively new) Bones: Skeleton Secrets of the Animal World exhibit at the Great North Museum: Hancock. The exhibit is on the first floor, in the space where the Spineless exhibit was. If you went to that exhibit, you’ll know the room was divided up, and there was a play space at the end. That exhibit had lots of things aimed at little ones, whereas this one fills the whole room (minus a small section) and there’s less for toddlers but more for preschoolers, older children, and adults. For my curious 4 year old it was a huge hit. 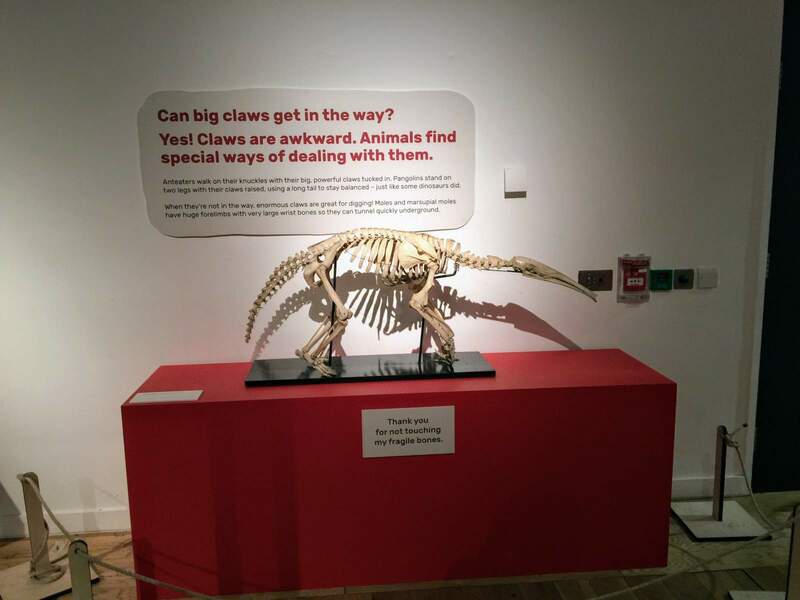 Find out more about Bones: Skeleton Secrets of the Animal World, which is on in the Great North Museum until Sunday 14th May 2017. 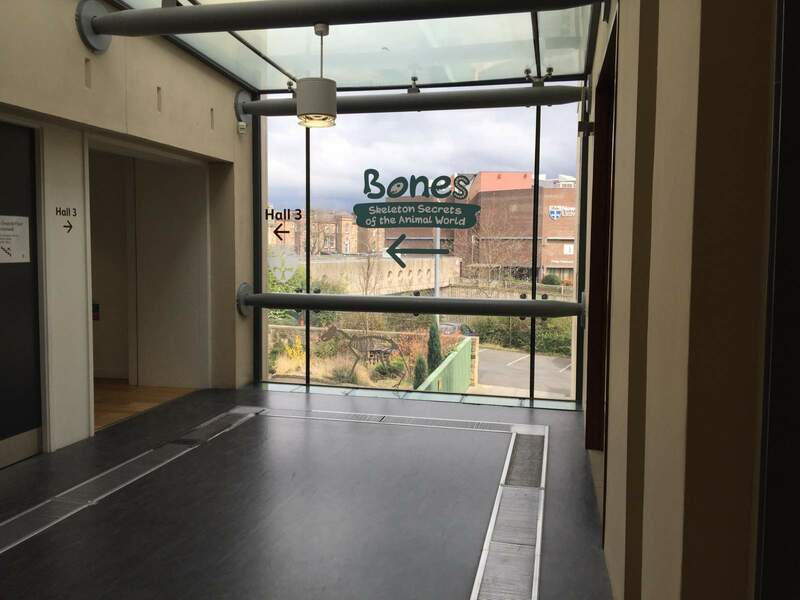 The entrance to the exhibit is through a set of rib bones poking out of the floor. Quite an impactful way to start the tour, and instantly James was hooked. Noah just liked jiggling his belly when I explained where his ribs were, so they both were happy at this point. 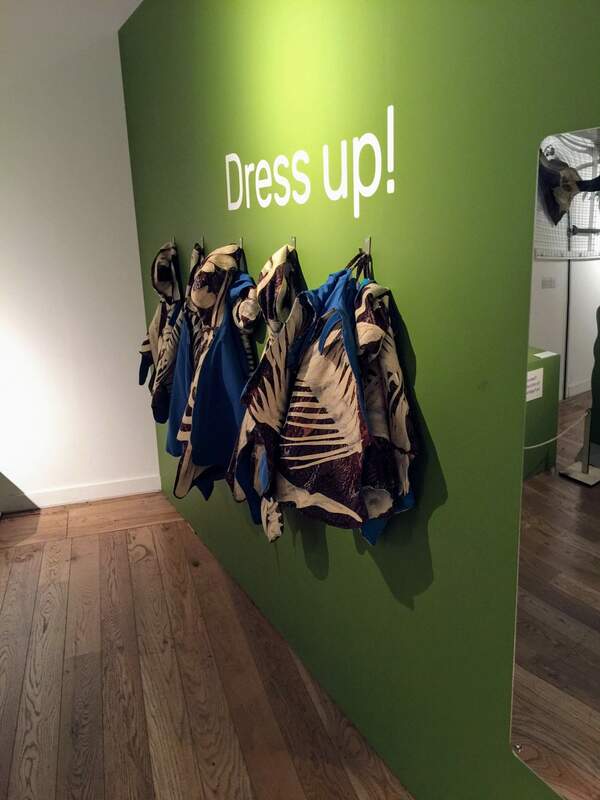 There are lots of interactive points around the room, including videos, this lovely maze game, and a dress up corner. The language used throughout is good for age 4 and up, I’d say. There wasn’t much I had to explain beyond reading the card, with the exception of things that have prompted massive discussions. We wandered around looking for a skull that looked like a human’s, and then looked for something belonging to a whale, so our tour around the items on display was somewhat sporadic. We followed a 4 year old’s thought patterns, rather than a strict linear pattern through the room. We were interrupted far more times than I care to consider by me having to ask James to stay with the pushchair while I sped after Noah. He was absolutely intent in exploring the next space, whatever that might be. 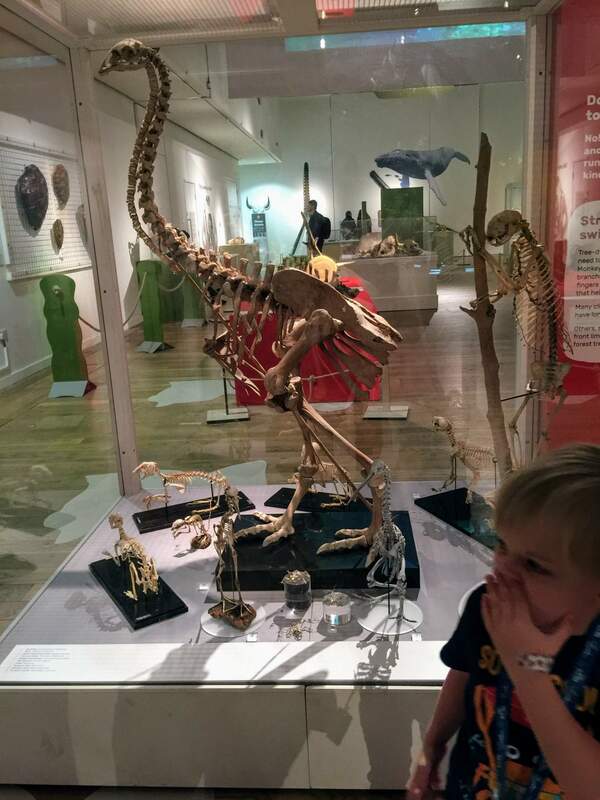 A few things grabbed his attention, but I think the majority of the Bones exhibit is not suitable for the average, active, 2 year old. I think he spent about 5 seconds bashing at the Xylobone musical game at the beginning, and then 10 seconds putting on a dress-up cape, before tearing it off 2 seconds later. There are some points around the room with headphones, which you put just one to an ear, and listen to the music, or the narration of the film on the screen. James as a bit of a thing against bats, and I was a bit apprehensive about him listening to the information about them, in case it prompts horrible dreams later, but it was obviously really good. He told me all about the bats through the day today, and detailed facts about them tonight while I was getting him ready for bed. Not bad for something he heard yesterday. FOSSILS from Roots and Wings on Vimeo. 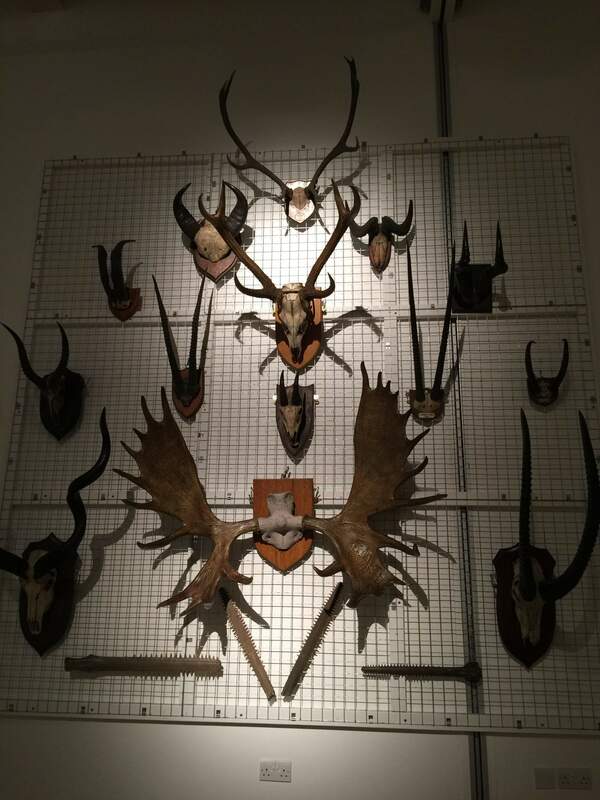 If you’ve not got a toddler running off into the rest of the museum, you can line up with this selfie spot and make it look as though you have antlers, no doubt to hilarious effect. 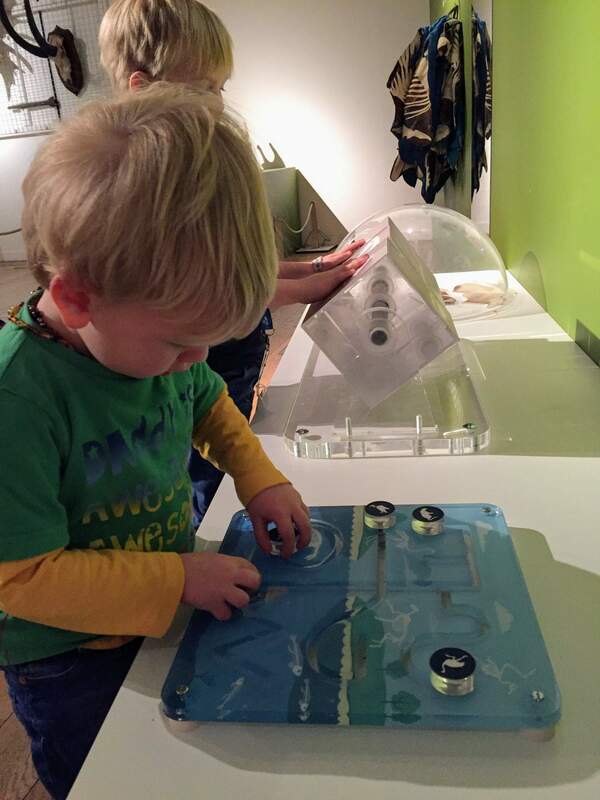 If you have got a toddler, this Toddler take over day on Friday 7th April looks like lots of fun, getting little ones involved in the museum behind-the-scenes processes. I think they probably are a bit young, just like Noah, but you will probably enjoy it if you get a spare few hours to yourself!